In matters of safety it is always better to be proactive and put preventative measures in place than to react only when a problem arises. This is particularly true when it comes to lightning protection because it is very difficult to predict when it will occur and where it will strike. 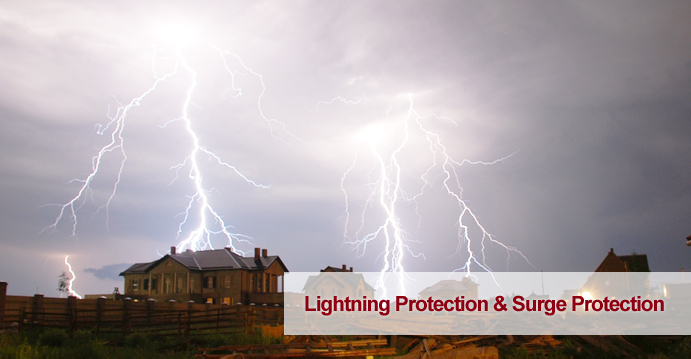 An efficient lightning protection system will protect the property, its contents and inhabitants, and will give you peace of mind even if it is never needed. When we are designing a lightning protection system we always keep in mind that the current can enter a property by striking it directly, by flowing through pipes in the ground, or via cables. Once it enters the structure it can travel through the electrical system, plumbing, air conditioning and even the rebar in the walls or floors. All of these possibilities need to be considered in order to maximise safety. The best lightning protection systems consist of a grounding system to prevent lighting from striking the property directly and surge protection to stop the current from flowing through cabling. The grounding will consist of a series of conductors to carry the current away from the property, creating a single unobstructed path or several routes so the current can make its way to rods driven into the ground. This allows safe dispersion of the current into the earth. The ground rods need to be positioned carefully to ensure the current can’t jump to any cables or pipes buried in the ground if the system is called into action. Grounding and surge protection can also help to reduce the risk of fire in the event of a lightning strike. If the current strikes an unprotected property the huge amount of energy can cause conductors to heat up to incredible temperatures, potentially igniting any flammable materials touching them. This is particularly problematic with cables because it could lead to a fire at any point along the wiring. We have extensive experience with Coventry lightning protection and can create bespoke systems for all properties, ensuring they are protected as effectively as possible. If you have any questions or would like to arrange a consultation please contact us and we will be happy to help.